Larrea tridentata is known as creosote bush and greasewood as a plant, as chaparral as a medicinal herb, and as gobernadora in Mexico, Spanish for “governess”, due to its ability to secure more water by inhibiting the growth of nearby plants. In Sonora, it is more commonly called hediondilla. Larrea tridentata is a prominent species in the Mojave, Sonoran, and Chihuahuan Deserts of western North America, and its range includes those and other regions in portions of southeastern California, Arizona, southern Nevada, southwestern Utah, New Mexico, and Texas in the United States, and Chihuahua, Sonora, Coahuila, Nuevo Leon, Zacatecas, Durango and San Luis Potosì in Mexico. The species grows as far east as Zapata County, Texas, along the Rio Grande southeast of Laredo near the 99th meridian west. Larrea tridentata is an evergreen shrub growing to 1 to 3 m (3.3 to 9.8 ft) tall, rarely 4 m (13 ft). The stems of the plant bear resinous, dark green leaves with two opposite lanceolate leaflets joined at the base, with a deciduous awn between them, each leaflet 7 to 18 mm (0.28 to 0.71 in) long and 4 to 8.5 mm (0.16 to 0.33 in) broad. The flowers are up to 25 mm (0.98 in) in diameter, with five yellow petals. Galls may form by the activity of the creosote gall midge. 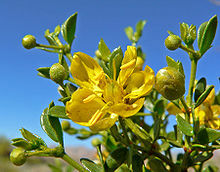 The whole plant exhibits a characteristic odor of creosote, from which the common name derives. In the regions where it grows, its smell is often associated with the “smell of rain”. As the creosote bush grows older, its oldest branches eventually die and its crown splits into separate crowns. This normally happens when the plant is 30 to 90 years old. Eventually, the old crown dies and the new one becomes a clonal colony from the previous plant, composed of many separate stem crowns all from the same seed. The “King Clone” creosote ring is one of the oldest living organisms on Earth. It has been alive an estimated 11,700 years, in the central Mojave Desert near present-day Lucerne Valley, California. This single clonal colony plant of L. tridentata reaches up to 67 ft (20 m) in diameter, with an average diameter of 45 ft (14 m). King Clone was identified and its age estimated by Frank Vasek, a professor at the University of California, Riverside. Measurements of the plant, as well as radiocarbon dating of wood fragments, were used to determine the plant’s mean annual growth rate outward from the center of the ring. By measuring the diameter of the ring, its total age could be estimated. 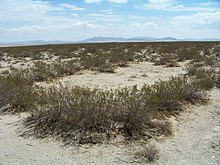 It is within the Creosote Rings Preserve of the Lucerne Valley and Johnson Valley. Creosote bush is most common on the well-drained soils of alluvial fans and flats. In parts of its range, it may cover large areas in practically pure stands, though it usually occurs in association with Ambrosia dumosa (burro bush or bur-sage). Chemicals found in creosote bush roots have been shown to inhibit the growth of burro bush roots, but as of 2013, much of their relationship remains unexplained. Creosote bush stands tend to display an evenly spaced distribution of plants. Originally, it was assumed that the plant produced a water-soluble inhibitor that prevented the growth of other bushes near mature, healthy bushes. Now, however, it has been shown that the root systems of mature creosote plants are simply so efficient at absorbing water that fallen seeds nearby cannot accumulate enough water to germinate, effectively creating dead zones around every plant. Owing to the harshness of the germination environment above mature root systems, young creosote bushes are much more susceptible to drought stress than established plants. Germination is quite active during wet periods, but most of the young plants die very quickly unless water conditions are optimal. Ground heat compounds the young plants’ susceptibility to water stress, and ground temperatures can reach upwards of 70 °C (160 °F). To become established, the young plant apparently must experience three to five years of abnormally cool and moist weather during and after germination. From this, it can be inferred that all the plants inside a stand are of equal age. Mature plants, however, can tolerate extreme drought stress. In terms of negative water potential, creosote bushes can operate fully at -50 bars of water potential and have been found living down to -120 bars, although the practical average floor is around -70 bars, where the plant’s need for cellular respiration generally exceeds the level that the water-requiring process of photosynthesis can provide. Cell division can occur during these times of water stress, and new cells commonly quickly absorb water after rainfall. This rapid uptake causes branches to grow several centimeters at the end of a wet season. Water loss is reduced by the resinous waxy coating of the leaves, and by their small size, which prevents them from heating above air temperature (which would increase the vapor pressure deficit between the leaf and the air, thus increasing water loss). Plants drop some leaves heading into summer, but if all leaves are lost, the plant will not recover. Accumulation of fallen leaves, as well as other detritus caught from the passing wind, creates an ecological community specific to the creosote bush canopy, including beetles, millipedes, pocket mice, and kangaroo rats. Native Americans in the Southwest held beliefs that it treated many maladies, including sexually transmitted diseases, tuberculosis, chicken pox, dysmenorrhea, and snakebite. The Coahuilla Indians used the plant for intestinal complaints and tuberculosis. The Pima drank a decoction of the leaves as an emetic, and applied the boiled leaves as poultices to wounds or sores. Papago Indians prepared it medicinally for stiff limbs, snake bites, and menstrual cramps. The shrub is still widely used as an herbal medicine in Mexico. Larrea tridentata is often referred to as chaparral when used as a herbal remedy and supplement; however, it does not grow in the synonymous plant community chaparral. The United States Food and Drug Administration has issued warnings about the health hazards of ingesting chaparral or using it as an internal medicine, and discourages its use. In 2005, Health Canada issued a warning to consumers to avoid using the leaves of Larrea species because of the risk of damage to the liver and kidneys. ^ “Larrea tridentata“. Germplasm Resources Information Network (GRIN). Agricultural Research Service (ARS), United States Department of Agriculture (USDA). Retrieved 11 December 2017. ^ Peter Bigfoot (2011). “Chaparral”. Peter Bigfoot’s Useful Wild Western Plants. Retrieved 17 February 2013. ^ Moore, M. (1989). Medicinal Plants of the Desert and Canyon West. Santa Fe, NM: Museum of New Mexico Press. pp. 27–32. ISBN 978-0-8901-3181-7. ^ Felger, R. S.; Moser, M. B. (1985). People of the Desert and Sea – Ethnobotany of the Seri Indians. Tucson, AZ: University of Arizona Press. ISBN 978-0-8165-1267-6. ^ “Larrea tridentata”. Southwestern Environmental Information Network (SEINet). ^ “Brush”. The Vegetation Types of Texas. Texas Parks and Wildlife Service. ^ “Larrea tridentata“. The Jepson Manual. Berkeley, CA: University of California. Retrieved 30 December 2011. ^ “What is that smell before it rains?”. The Arizona Republic. 2017-02-07. Retrieved 2018-04-05. ^ “Creosote Bush”. US National Park Service. Retrieved 30 December 2011. ^ Vasek, F. C. (February 1980). 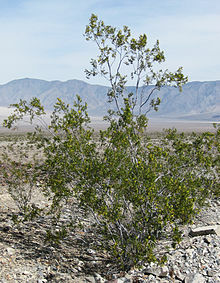 “Creosote Bush: Long-Lived Clones in the Mojave Desert”. American Journal of Botany. 67 (2): 246–255. doi:10.2307/2442649. JSTOR 2442649. ^ Weiser, M. “The oldest living thing is a quiet survivor”. High Country News. ^ a b c Rodrigue, F. “Creosote Rings Preserve – Larrea tridentata – Creosote bush”. Lucerne Valley Community Website. Retrieved 30 December 2011. ^ Schoenherr, A. A. (1995). A Natural History of California. Berkeley, CA: University of California Press. p. 14. ISBN 978-0-520-06922-0. ^ Marshall, K. Anna (1995). “Larrea tridentata”. Fire Effects Information System. U. S. Forest Service. ^ Mahall, Bruce E.; Callaway, Ragan M. (February 1991). “Root communication among desert shrubs”. PNAS. 88 (3): 874–876. doi:10.1073/pnas.88.3.874. PMC 50916. PMID 11607151. ^ Phillips, Donald L.; MacMahon, James A. (March 1981). “Competition and spacing patterns in desert shrubs”. Journal of Ecology. 69 (1): 97–115. doi:10.2307/2259818. JSTOR 2259818. ^ Schoenherr, A. (1992). A natural history of California. Berkley: University of California. p. 404. ^ “Larrea tridentata (Sesse’ and Moc. ex DC.) Coville – Creosote Bush” (PDF). US Forest Service. ^ Arteaga S1, Andrade-Cetto A, Cárdenas R. “Larrea tridentata (Creosote bush), an abundant plant of Mexican and US-American deserts and its metabolite nordihydroguaiaretic acid”, J Ethnopharmacology. 2005 Apr 26; 98(3): 231-9..
^ Nabhan, G. P. (1993). Gathering the Desert. University of Arizona Press. p. 16. ISBN 978-0-8165-1014-6. …health food stores have been marketing Larrea as a cure-all that they whimsically called “chaparral tea” – the plant never grows above the desert in true chaparral vegetation. ^ Tilford, G. L. (1997). Edible and Medicinal Plants of the West. Missoula, MT: Mountain Press Publishing. ISBN 978-0-87842-359-0. ^ “Health Canada warns consumers not to take products containing chaparral”. Health Canada. 21 December 2005. ^ “Chaparral”. Cancer Research UK. Retrieved August 11, 2013. “Creosote Bush”. US National Park Service. “Larrea tridentata“. Jepson Flora Project. Berkeley, CA: University of California. “Larrea tridentata“. Dr. Duke’s Phytochemical and Ethnobotanical Databases. Germplasm Resources Information Network – GRIN. “Larrea tridentata“. Fire Effect Information System. US Forest Service. “King Clone, The World’s Oldest Living Thing”. Botanical Record-Breakers. Waynesworld. “Creosote bush in desert landscape”. EPA. 2013-01-29. “Larrea tridentata“. CalPhotos. Berkeley, CA: University of California.